Our service vans carry thousands of parts! Because of our fully stocked service vehicles, over 90% of our services can be delivered on the spot, saving you time and money. Your electrical panel is the heart of your home's electrical system, directing and monitoring the flow of electricity throughout your home. 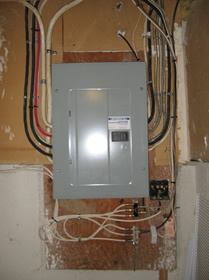 Having an electrical panel that is safe and efficient is of the utmost importance. Old fashioned fuse panels use outdated technology, and were built to much lower safety standards than modern breaker panels. Having to replace fuses after a fault condition is not only inconvenient but also dangerous. 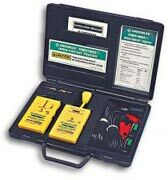 It exposes you to the live electrical parts of your service panel, which if contacted could cause a fatal shock. It also leaves circuits vulnerable to "over fusing", seen far too often, which can cause wires to heat up and start electrical fires. Unlike fuse panels, modern breaker panels facilitate the use of life safety equipment now required by the Canadian Electrical Code such as arc-fault, and ground fault circuit interrupting breakers, which protect you and your family against fire and fatal shock. Adding air conditioning, swimming pool, hot tub, or any other equipment which uses significant power. At Rand Electric, service panel upgrades are our specialty. 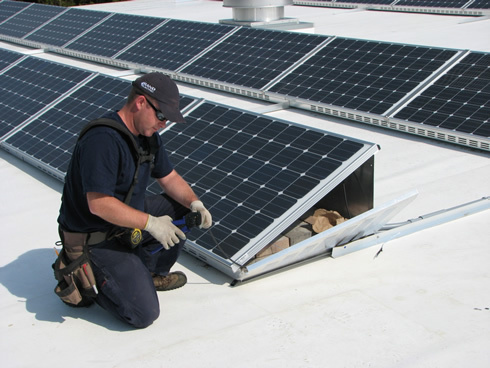 All service panel upgrades are backed by industry leading service panel warranties. Contact us now to have one of our licensed electricians explain your Panel Upgrade options. Are You Being Troubled By Any of These Symptoms? 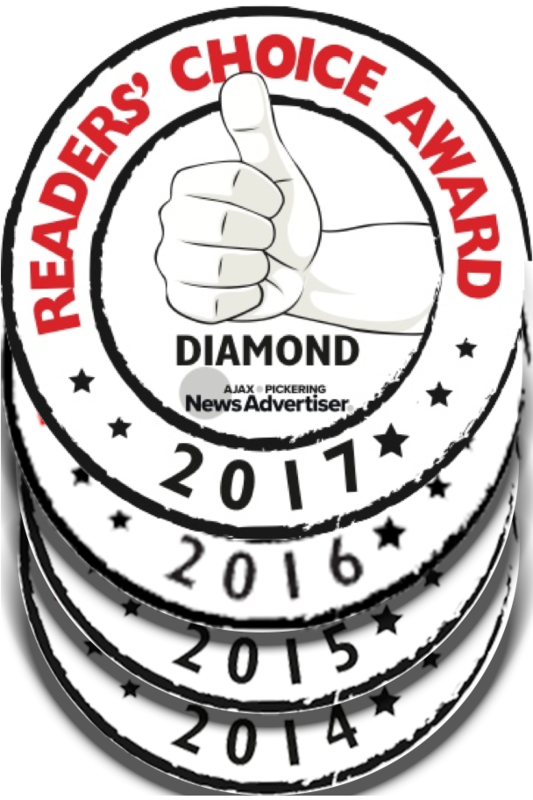 You can put your mind at ease by knowing your safety and the integrity of your wiring is our number one priority. Troubleshooting electrical problems requires a knowledgeable technician and the latest in diagnostic equipment. At Rand Electric we employ both of these to solve your electrical problems so you can stop worrying and get on with your life. Contact us now to have one of our licensed professional electricians explain your options. 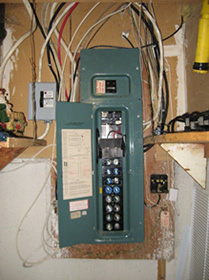 Service Panel - We will identify any service panels that no longer meet the safety standards of today. We will also check for any signs of overfusing, doubled up circuits, overloaded circuits, loose connections, water damage, as well as test ground fault and arc fault breakers for proper function. We will also make sure you system is properly grounded and that the water pipe and gas pipe are bonded together. Receptacle Grounding and Tension and Switch Operation - We will check all receptacles and make sure they are properly grounded for your safety, as well as make sure all receptacles are snug and make proper connections with plugged in items. We will also test all light switches for proper operation and tension. Surge Protection - We will check your incoming power, telephone and cable lines to see if they have stage 1 surge protection installed. We will also check equipment for stage 2 Surge Protection which gives you further protection for your sensitive equipment like computers and TV's. Essential Safety Repairs - These are repairs that your electrical professional has identified as a critical defect that could result in personal injury, electrocution or fire. Recommended Upgrades - These items, while not critical to your health and well-being, are not considered a "healthy" standard and repairing them will often improve the efficiency of your system and provide convenience to meet your lifestyle needs. 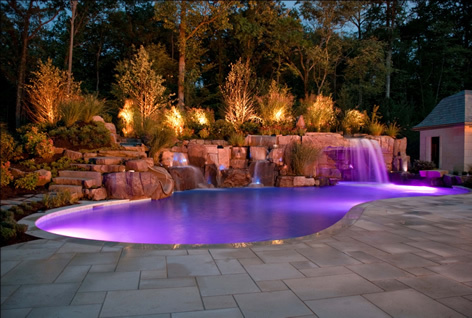 One of our specialties at Rand Electric is Pool, Spa, and Hot Tub wiring. From our first pool job way back in 1981 which was a modest in ground concrete pool in North York, to today averaging from about 50 to 100 pool, spa and hot tub related jobs per year, we are confident in our ability to handle everything and anything related to pool, spa and hot tub wiring. We have been involved with countless new pool and spa projects over the years with award winning pool builder Bonavista Pools, as well as many others. We are also Factory Authorized Service Technicians (F.A.S.T.) and a Contract Service Center (C.S.C. )for Zodiac Pool Systems Canada, servicing products by Zodiac Pool Systems, Jandy Pool Products, Polaris, Levellor, and Cover Pools. We are experienced in everything from your simplest backyard pool to your full scale water-park playground. We install and service control systems, salt water chlorinators, lights, pumps, and more. And why not complete that outdoor environment with Landscape Lighting, which is the perfect accent for any backyard, whether you have a pool or not. We can design and install a system that will meet your needs and help you get the most out of your properties lighting possibilities. Contact us today to have one of our electrically licensed pool, spa, and hot tub professionals take care any of your backyard living needs. Is it time to replace those outdated or damaged switches and receptacles with modern decorator style devices? Would you like to save money with energy efficient dimmers and at the same time enhance the light levels in any room? 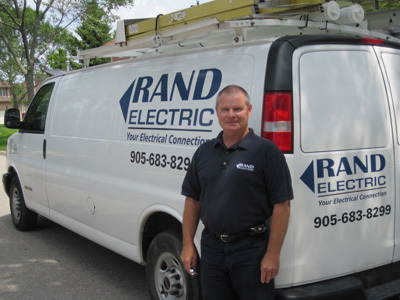 Have the professionals at Rand Electric explain your options. Did you know a major cause of house fires is the improper use of extension cords? 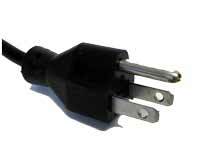 We can add new receptacles in convenient locations so you can eliminate the need for these dangerous and ugly cords. We also provide new circuits for appliances like over the range microwaves (OTR's), dishwashers, and garburators. At Rand Electric we are well versed in building construction and utilize all of the latest tools which allow us to get the job done promptly and properly. Contact us now to have one of our licenced electricians install your new receptacles, switches, dimmers, and any other devices you would like. 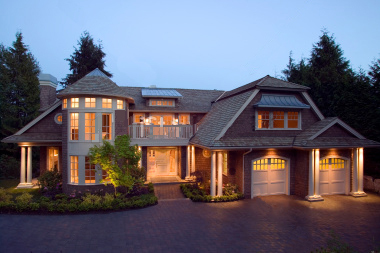 Add a little ambiance, elegance, sophistication, and even energy-efficiency to your home or outdoor area with our expert lighting services from Rand Electric. We offer a wide variety of electrical lighting repair and installation services, from outdoor lighting and recessed lighting to garden lighting and under cabinet lighting. To properly install home lighting, it takes more than a technical mind. A keen eye for design is also necessary when installing electrical lighting throughout your home and property. Our licensed electricians will survey your home's interior and exterior to provide expert advice on where to place additional lighting that will best suit the look of your home. Choose from garden lighting that will turn your backyard into a work of art, LED lighting that will help you save on your monthly energy bill, under-cabinet lighting for convenience and time-efficiency, and much more. As the popularity of ceiling fans continues to grow as more and more homeowners discover dramatic, year-round energy savings, we find ourselves installing more and more ceiling fans. In summer, ceiling fans create cooling breezes, which reduce the strain on air conditioners. Contact us today to have one of our licensed electricians explain all of your lighting and ceiling fan options. It is no secret that plug-in electric vehicles(EV) are becoming increasingly popular due to rising fuel costs and environmental concerns. In fact, industry forecasts predict an annual volume of 400,000 battery electric vehicles in North America by 2020. To support the vision of widespread EV, Ontario has announced a number of measures to help individuals, businesses and organizations choose clean and efficient vehicles, and to expand the battery electric vehicle market for manufacturers. Since July 1, 2010, when you buy or lease an eligible new plug-in electric vehicle in Ontario, you can receive a rebate of up to $8500 as an incentive to purchase an EV. Nissan and GM currently have electric vehicles on the market with the Nissan Leaf, a true electric vehicle, and the Chevy Volt, which is a hybrid with chargeable batteries. Due to the increasing popularity of these electric vehicles, a well developed residential, commercial and public infrastructure of charging stations is required to support the driver's needs for charging . 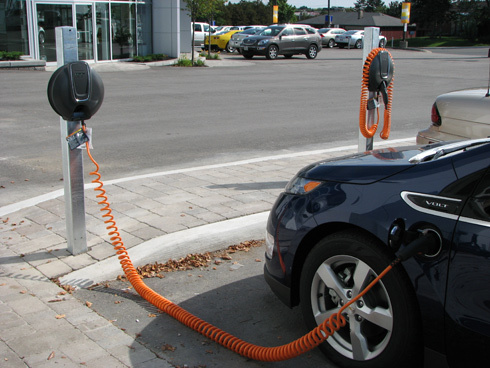 Rand Electric has recognized these needs and has taken the steps to become certified installers of Electric Vehicle Charging Equipment (EVSE). Residential Charging - Once the decision has been made to purchase an electric vehicle, the next step is determining how you would like to charge it. These vehicles come standard with 120 volt chargers which will fully charge the Leaf in about 20hours, and a Volt in about 10hrs. These lengthy charge times will be inconvenient for many EV owners, leading them to have a 240V charger installed by a qualified EVSE installer. These 240Vchargers will significantly reduce charge times; 7 hours for the Leaf, and 3 hours for the volt, as well as reduce general inconvenience. Commercial and Fleet Charging - Rand Electric can provide fleet and commercial customers with charging solutions that offer convenient public and private access. Advanced versions feature remote monitoring and billing capabilities. 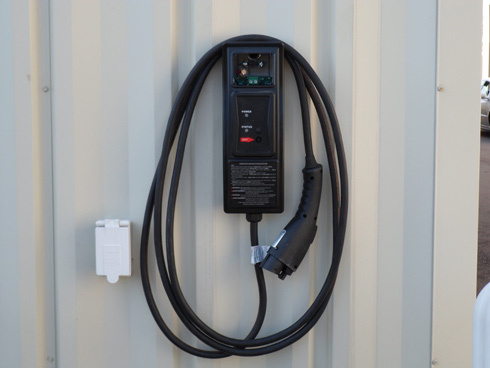 DC Quick Charging - Rand Electric is also ready to provide customers with fast charging solutions through the installation of DC quick charging stations. These can either be stand alone units or multiple units connected by a central dispenser. These DC quick charging stations will allow drivers to re-charge on route as easily as they do at gas stations today. Contact Rand Electric to have one of our certified Electric Vehicle Supply Equipment installers, and licensed electricians discuss your charging options. Consider the benefits of generating green energy from renewable sources such as the sun and selling it for a guaranteed price. You can be part of Ontario's growing green energy movement, make money and contribute to a cleaner environment. If you are a homeowner, farmer or business owner, you have the opportunity to develop a renewable electricity generation project on your property. Under the microFIT and FIT Programs, you will be paid a guaranteed price, as much as 80.2cents/KillowattHour, for any electricity your system produces for at least 20 years. At Rand Electric we provide full turn-key Solar Photovoltaic solutions from financing right up to installation and monitoring. Contact us today to discuss your Solar PV options. How vital is electricity to your everyday life? Most of the time you don't realize it until it is gone. How could you live without some of these devices in your everyday life? Or Any Other Household Appliances! How Does a Home Standby Generator Work? - Overall, the concept is simple, but don't let that fool you. It takes a fully trained staff to perform the installation. A system works by having a self contained unit that produces back up power that automatically transfers into your home's electrical system when the power goes down. Where does the generator unit go? How big is it? - Your standby home generator will be located outside of your home, near the location of your main electrical service line. Many times the unit can be easily hidden behind a fence or screened with a small landscape bed. For most residential units they are about the same size as your standard air conditioning unit. How much power can I get from a standby generator? - The answer to this question is determined by how much power the customer wants for their home. Residential standby generators offer a wide range of power outputs that can provide power to a portion of your home, or the entire house. That is up to you. What's involved with installing a stand by generator? - For our customers we offer a turnkey service from initial consultation, to system start up, into a continuing service schedule to maintain your investment. We cover every component of the installation from fuel and electrical connections, to permitting and inspections. All we require from the client is the desired installation date and what circuits within the home they want on stand-by emergency power. Contact our professional installation team to discuss your standby generator options. Electrical Power Surges..... Are they really a problem? 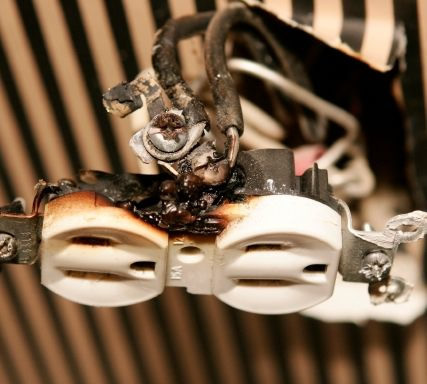 A homeowner can help protect against such costly damage with a comprehensive approach to surge protection. Rand Electric's surge protection products offer you the homeowner, a complete approach, by offering both Stage 1 and Stage 2 surge protection. Stage 1: Service entrance protection is designed to provide premier surge protection for AC power, telephone and cable at the point of entrance to your home. This type of protection reduces surges to an acceptable level for surge strips to handle at the point of use. Stage 2: Point of use surge protection is utilized in the form of surge strips that are designed to offer premium protection for specific sensitive electronic devices like your compuer, TV and stereo, while providing innovative features to enhance user convenience and safety. Contact Rand Electric today to discuss your surge protection options. It is estimated that there were approximately 450,000 homes in Canada wired with aluminum wiring in the mid 1960's to late 1970's. Over the past decade there has been increasing pressure from insurance companies to have aluminum wiring inspected and repaired or replaced as necessary. Reported problems with aluminum wiring have been related to the overheating and failure of aluminum wiring terminations. This is due to aluminums tendency to oxidize and its incompatibility with devices designed for use with copper wiring. As mentioned above, where problems exist with aluminum wiring they are usually found at termination points. This requires the opening of all outlets (receptacles, switches, fixtures, appliance connections, and in the panel board) and visually inspecting terminations for signs of failure and overheating without removing or disturbing the devices or wiring. There should be no signs of overheating such as darkened or discoloured connections, melted insulation, etc. Where problems are found the damaged aluminum conductor should be cut back to remove the damaged portion and then the necessary repairs made. In most cases homes built in the 60's and 70's have had the receptacles, switches, and light fixtures replaced at some point, and most times they were replaced unknowingly with devices designed for use with copper wiring, not rated for aluminum. In this case we will replace copper only devices with devices rated for use with aluminum. These devices have the marking CO/ALR. Using these devices will prevent poor connections and the possibility of fire. If you are looking for a more thorough solution for piece of mind, or are having renovations done you will want to consider having your homes aluminum wiring removed and replaced with copper wiring. This is usually more costly but will insure your electrical system is brought up to today's safety standards. Are you having your kitchen or bathroom renovated? How about finishing your basement or adding that addition you have always wanted? Beware of renovation contractors who assure you that they can "take care of the electrical work" themselves, say things like "it's very simple". Most times they do not have an Electrical Contractor's License, and are not qualified or insured to perform electrical work. It is shocking how many dangerous code violations, and fire hazards we see associated with past renovations and additions. 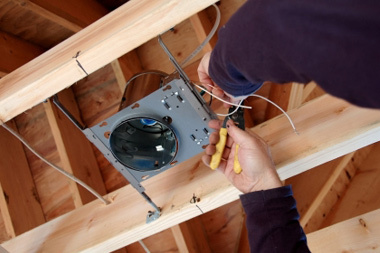 Any time you make modifications to your electrical system the work should be done by a Licensed Electrical Contractor. At Rand Electric we are well versed in building construction and utilize all of the latest tools which allow us to get the job done promptly and properly. Contact us now. Our licensed electricians are ready to provide you with code compliant wiring solutions for your next renovation or addition. A ground fault circuit interrupter (GFCI) is an inexpensive electrical device that, if installed in household branch circuits, could prevent over two-thirds of the approximately 300 electrocutions still occurring each year in and around the home. Installation of the device could also prevent thousands of burn and electric shock injuries each year. GFCI's protect against accidental electric shock or electrocution by acting immediately to shut off the circuit if they sense a dangerous ground fault, or "leak" of current from the circuit. Because a GFCI detects ground faults, it can also prevent some electrical fires and reduce the severity of others by interrupting the flow of electric current. GFI's are required at kitchen counters, bathrooms, garages, laundry rooms, and any outdoor areas - anywhere water can come in contact with the outlet. Why Does My Home Need Arc-Fault Circuit Interrupters (AFCI)? To protect you and your family against arc-faults, which can very easily turn into electrical fires. Statistics show that, on average, fire kills eight people each week in Canada, with residential fires accounting for 73% of these fatalities. And arc faults in a home are one of the leading causes for household fires. In 2002 the Canadian Electrical Code (CEC) made a code change that required arc fault breakers be installed for bedroom circuits in ALL new homes. Since this technology was not required on most homes built before 2002, we recommend adding AFCI's to ensure safety and protection to your home. 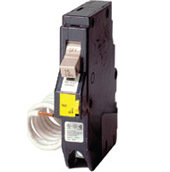 An Arc Fault Circuit Interrupter (AFCI) is a special circuit breaker designed to prevent fires by detecting dangerous arc-faults and disconnecting the power before the arc starts a fire. 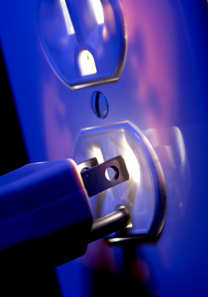 Don't risk an electrocution or fire in your home. Contact us today to have one of our licensed electricians explain your GFCI and AFCI needs. 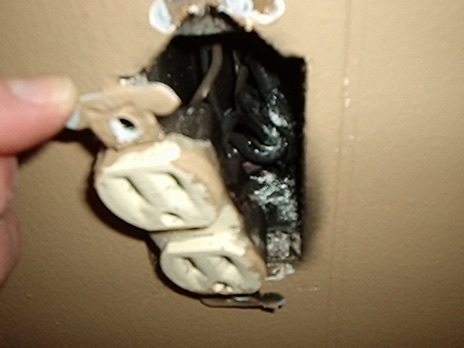 Older houses are often found to have 2 pronged outlets or ungrounded outlets. While it only takes the two wires to bring electricity to your appliances and have them work correctly there is a problem with safety. The third wire is a safety device built into your electrical system. It is the wire which is referred to as a ground and it is designed to provide an effective path to "earth" to help prevent electrocution hazards should an appliance or its wiring fail. The following appliances commonly require a grounded receptacle or circuit for both safety and warranty reasons. For more information consult your manufacturer or warranty documentation. Don't worry, you have options. Contact us now to have one of our licensed electricians explain your options and help you on your way to a code compliant safe solution. Do you have working Smoke Detectors and Carbon Monoxide detectors in your home? Many homeowners believe that they are properly protected when in reality they are not. Did you know that Smoke Detectors should be replaced every 10 years and Carbon Monoxide Detectors every 5-7 years? Even if they seem alright when tested, internal sensors can become weak over time leaving you unprotected. The date is on the back of every smoke and CO detector. When was the last time you checked the date on yours? Most fatal fires occur at night when people are asleep. Often, victims never wake up. Working smoke alarms will detect smoke and sound an alarm to alert you, giving you precious time to escape. Every home in Ontario by law must have a working smoke alarm on every storey and outside all sleeping areas. Failure to comply with the Fire Code smoke alarm requirements could result in a fine of up to $50,000 for individuals or $100,000 for corporations. There are many different brands of smoke alarms available on the market but they fall under two basic types: ionization, photoelectric and then there are dual sensor, which combine both technologies. Ionization - Ionization alarms sound more quickly when a flaming, fast moving fire occurs. Photoelectric - Photoelectric alarms are quicker at sensing smoldering, smokey fires. 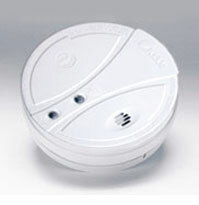 Dual Sensor - Dual sensor smoke alarms combine ionization smoke alarms and photoelectric smoke alarms into one unit. Carbon monoxide (CO) is a serious danger and one that many people do not understand. It is the #1 cause of unintentional poisoning deaths in North America. In Canada, there are approximately 1,000 reported poisonings and 250 deaths per year due to carbon monoxide. Known as the silent killer, Carbon Monoxide (CO) is an odourless, colorless gas produced by incomplete burning of fuel, such as, natural gas, propane, kerosene, gasoline, oil, wood and charcoal. You need a carbon monoxide (CO) alarm if you have an attached garage, wood or gas fireplace, or any one of these gas appliances: furnace, water heater or range / stove. 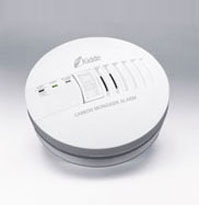 Carbon Monoxide Detectors are available as stand-alone units or as combination Smoke Detector/CO Detector. Hardwired smoke and carbon monoxide detectors installed by a licensed electrician provide far superior protection when compared to battery operated devices. Hardwired/Interconnected detectors are connected to the household electrical system and have a battery backup. These smoke detectors are also interconnected to the other smoke detectors and carbon monoxide detectors throughout your home by electrical wiring. This way if one detector senses a problem it will go into alarm mode and will activate all other interconnected alarms throughout the house alerting all occupants of danger. When our electrician interconnects your smoke detectors, and carbon monoxide detectors, you are given more response time. If there is a fire in another part of the house while you are sleeping, the smoke alarm that detects the problem will signal the rest of the alarms in your house. This way the alarm on the floor where you sleep will sound and wake you and your children up before the fire reaches you. Interconnected smoke detectors are far safer than stand-alone smoke detectors. Contact us today to have one of our licensed electricians explain all of your smoke and carbon monoxide detector options.